Peru is South America's third-largest country, with an area of 496,226 square miles (1,285,220 square kilometers), slightly smaller than the state of Alaska. Peru is divided into three contrasting topographical regions: the coast, the Andean highlands, and the Amazon rainforest to the east, with 18 rivers and 200 tributaries. The Peruvian Andes are divided into three chains. 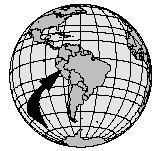 The western mountain chain runs parallel to the coast and forms the Peruvian continental divide. Less regular are the Cordillera Central and Cordillera Oriental. Lake Titicaca (Lago Titicaca), the highest navigable lake in the world (about 12,500 feet/3,800 meters high), lies partly in Peru and partly in Bolivia. 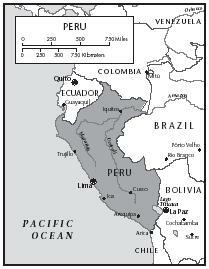 The first inhabitants of Peru are believed to have migrated from Asia around 6000 B.C. These early nomadic (roaming) tribesmen relied on the hunting of animals and the gathering of fruits and plants to survive. By 5000 B.C. , small communities were established and the early cultivation of cotton, chili peppers, beans, squash, and maize (similar to corn) began. Most of the early settlers lived near the coast, where the wet climate allowed for planted seeds to grow. pits have been discovered buried with mummies dating as far back as 750 B.C. The Incas came to power in the 1400s. They survived mostly on maize and potatoes that they planted on terraces that they carved out of steep hillsides (which can still be seen today). Their empire was short-lived, however. In 1528, the Spanish conquistador Francisco Pizarro discovered Peru and was intrigued by the riches of the Inca Empire. The Spanish helped to introduce chicken, pork, and lamb to the Incas. In return, the Incas introduced the Spanish to a wide variety of potatoes and aji (chili peppers). As the Spanish gained control, they demanded that the natives grow such European crops as wheat, barley, beans, and carrots. As European disease struck the Incas and a shortage of labor arose, slaves from Africa were brought over to work on the new plantations. Africans contributed such foods as picarones (anise-sweetened, deep-fried pastries made from a pumpkin dough), to the Peruvian cuisine, as did Polynesians from the Pacific Islands, the Chinese, and the Japanese. Prick the potatoes a few times with a fork and bake them in the middle of the oven for 1 hour. Let the potatoes cool, halve them lengthwise, and scoop them out, leaving a ¼-inch shell; reserve the potato pulp for another use. Cut each shell lengthwise into 6 strips and arrange the strips on a baking sheet. Brush the strips with the oil, sprinkle them with paprika, salt, and pepper, to taste, and bake them again at the same temperature for 20 to 25 more minutes, or until they are crisp and golden brown. Serve the potato skins with the sour cream. Combine ingredients in a medium-size bowl; mix well. In a large bowl, sprinkle the yeast over the lukewarm water and stir to dissolve. Add the sugar, egg, pumpkin, and salt; combine thoroughly. Add the flour, ½ cup at a time, until the dough becomes too stiff to beat with a wooden spoon. Turn the dough out onto a lightly floured board and knead in enough of the remaining flour to prevent the dough from sticking to your fingers. Continue kneading until the dough is smooth and elastic (about 8 minutes). Shape it into a ball and place in a greased bowl. Cover and let rise in a warm place for 1 hour, or until doubled in size. Punch down the dough and tear off pieces, shaping into doughnut-like rings, about 3 inches in diameter. Heat about 1-inch of oil in a deep skillet and fry the fritters for about 5 minutes, turning them once, until crisp and golden brown. Drain on paper towels and serve immediately with warm maple syrup. The Peruvian cuisine largely consists of spicy dishes that originated as a blend of Spanish and indigenous foods. Such dishes are often referred to as Criolla , or Creole. Aji (chili) is the most popular spice in Peru and is used in a variety of ways to give food extra flavor. Mint, oregano, basil, parsley, and cilantro are also included in Peruvian dishes, particularly soups and stews. Aside from spices, however, potatoes, rice, beans, fish, and various grains are essential staples (foods eaten nearly everyday) in the Peruvian diet. The diet of people living in the highlands includes corn, potatoes, and rice. 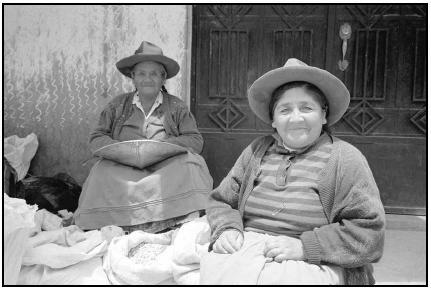 These women offer sacks of dried corn and other grains to shoppers at a market near Lake Titicaca. divided into coastal, mountainous/highland, and tropical. In addition, the impact of various ethnic influences can be seen through indigenous (native), Spanish, Asian, and African cooking styles and dishes. The Pacific Ocean provides Peru with a wide variety of seafood, particularly for those who live near the coast. Ceviche —fish, shrimp, scallops, or squid marinated in a lime and pepper mixture—might be considered one of the country's national dishes, due to its overwhelming popularity. It is often served with corn-on-the-cob, cancha (toasted corn), or sweet potatoes. Salads in this region are also common, particularly huevos a la rusa (egg salad) and palta rellena (stuffed avocado). The mountainous/highland diet closely resembles food the Incas prepared hundreds of years ago. Basic staples of potatoes, corn, rice, and various meats (especially beef and pork) are common ingredients in the highland cuisine. Choclo con queso (corn on the cob with cheese) and tamales (meat-filled corn dumplings) are popular corn dishes. Lechón (suckling pig), cuy (guinea pig), chicharrones (deep-fried pork and chicken), and pachamanca (meat cooked over a hot stone pit) are common meat dishes in this area. Soups containing an abundance of spices, onions, and eggs, as well as freshly caught fish from Lake Titicaca (particularly trout), help satisfy the highlanders' appetites. Meats and fresh fruits and vegetables are the basis of the tropical Peruvian diet. Bananas, plantains (similar to the banana), and yucca (similar to a yam) are readily available, and therefore are eaten in great quantities. Inhabitants of the tropical region also enjoy a variety of fish, wild game (such as boars, monkeys, pigs, deer, and chickens), and plenty of rice. Boil corn on the cob in salted water in a large pot, about 15 minutes. Let cool and remove kernels from cob by standing the cob on an end and slicing downward with a knife. Place a few kernels of corn with one cube of cheese on each toothpick (or as fits). Serve cold. Street vendors throughout the country often sell some of Peru's most beloved food and drinks. Coconut-, chocolate-, and lemon-flavored tortas (cakes) are sweet and loved by Peruvians of all ages. Helado (ice cream) is a favorite among children. Snacks such as fried plantain and chifles (banana chips) are widely available, as is Inka Cola, a Peruvian bubble-gum-flavored soft drink. What is not available from vendors will likely be sold at a local meat or produce market or a local panaderías (bakery). 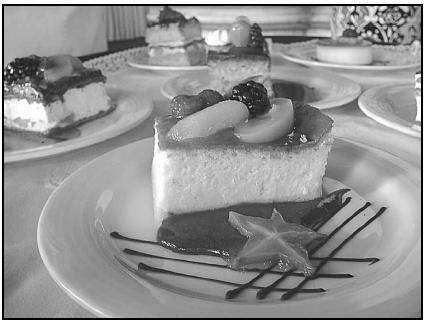 Flan, a sweet dessert garnished here with a slice of star fruit, is a favorite in restaurants throughout Peru. As a result of Peru's heavy Spanish influence, most Peruvians (90 percent) are devout Catholics. Christian holidays such as Easter, Christmas, and All Saints' Day are joyously celebrated throughout the country, often with fireworks, bullfights, dancing, and roast pig. The remainder of the population adheres to indigenous beliefs, believing in the gods and spirits the Incas once did hundreds of years ago. Many Christian holidays coincide with existing traditional festivals, allowing most Peruvians, regardless of differences in beliefs, to celebrate together. Christmas brings great joy to the Christians of Peru, especially children who await the arrival of Santa Claus. Families use the holiday time to travel to the homes of family and close friends. Because of the number of people rushing about through Peru's streets, vendors rush to sell holiday foods and other goods to passing people. Sweet mango juice, bakery rolls, and homemade doughnuts coated with sugar and syrup are Christmas favorites. Flan, caramel custard enjoyed throughout Central and South American countries (as well as Spain, the Philippines, and the United States), is also a dessert enjoyed by Peruvians. Pour into a flan mold (oven-proof straight-sided souffle dish or individual molds work nicely), covering all sides and bottom with the sugar syrup. Place in the refrigerator while preparing flan. Bring milk and vanilla to a boil in a small pot over low heat. In a separate mixing bowl, combine the eggs and ¾ cup sugar, beating well. Slowly add the egg and sugar mixture to the boiled milk. Pour into refrigerated mold. Place flan mold into a larger baking dish. Add water to a depth of about one inch, and carefully place in the oven. Bake 35 to 40 minutes. Flan is done when knife inserted in the center comes out clean. Cool and remove from mold. Serve chilled. Carnavales (kar-nah-VAH-lays; Carnival) is an elaborately celebrated national holiday that takes place a few days before Lent. It is the last opportunity for people to drink and dance before the fasting period of Lent begins, when such activities are not allowed. During these few days, some practice native traditions of rounding up wild game to present to a priest or mayor, who in return provides chichi and cocoa leaves. The offering of the animals dates back several hundred years to the Incas, who used to give offerings of food to the gods in hope for a good harvest. Papas a la huancaína (potatoes with cheese) is a popular meal during Carnival. Scrub the potatoes, place them in a saucepan, cover with water, and boil until tender (about 20 minutes). Drain, allow the potatoes to cool. Peel them, cut them into quarters, and set aside. In a small mixing bowl, combine the lemon juice, red pepper, and salt. Add onion slices and coat them with the mixture. Stir well and set aside. Heat oil in a large skillet over low heat. Add cheese, turmeric, and heavy cream. Stirring constantly, continue cooking over low heat until cheese melts and mixture is smooth. Add the cooked potatoes and gently stir to heat through, about 5 minutes. Do not allow mixture to boil, or it will curdle. Transfer to a serving bowl and garnish with hard-boiled eggs. Sprinkle onion mixture over the potatoes. Serve immediately while potatoes are hot. Peruvians are extremely hospitable and enjoy preparing and eating meals with company. Guests often consider being invited for dinner as a semiformal occasion. Nice clothes are worn and a small gift of flowers, chocolates, or wine is offered to the host on such occasions. Most of the time, however, Peruvians simply prepare meals for themselves. Meals consumed by a typical village family often depend on the altitude of their village and what crops can thrive there. People living in mountainous areas can grow potatoes and select grains, as well as raise llamas, sheep, goats, and cattle. At lower altitudes, fruits and vegetables such as lemons, limes, palta (avocados), and aji (chilies) can be cultivated. Villagers are often responsible for their own land and must spend much of the day tending to it. As a result, a villager's day begins early, usually around dawn. The woman of the house will begin her day preparing an herbal tea called mate (MAH-tay) and various foods for her family. A light desayuno (breakfast) may include triangular-shaped rolls, roasted wheat kernels, mote (boiled dried corn), bread, and te (tea) or cafe (coffee). The main meal of the day is almuerzo (lunch), which the woman of the house typically begins preparing while her family eats desayuno in the early morning. Almuerzo is important so workers will not be hungry in the fields. It may consist of a thick broth of potatoes, corn, and barley, palta aji sauce (avocado chili sauce) with vegetables, and cool beverages. Adults may enjoy chicha , a beer made of fermented maize, while children might prefer jugos (fruit juice), gaseosa (soft drink), or hot cocoa. Cena (dinner) is often the most filling, despite almuerzo typically being the main meal of the day. Potatoes will almost always make up one of the two to three dishes served for cena . Mote (boiled dried corn) with meat or the popular ceviche (marinated seafood) may complete lunch or dinner. Children may drink chicha morada (a soft drink made from maize) as a refreshing accompaniment to most meals. Peruvians enjoy sweets, whether it is an extra-sweet soft drink or honey-filled dessert. Churro , a deep-fried, honey-filled pastry, revolución caliente (crunchy, spicy cookies), and arroz con leche (rice and milk) are sold by street vendors throughout the country. Shish kebabs, seafood, fruit juice, empanadas (meat- or cheese-filled pies), and other popular Peruvian fare are also sold by vendors. Many Peruvian children do not eat at midday during school hours. However, a combination of mote , noodles, beans, and potatoes is commonly eaten among school children. Mix the lime juice with the onion slices, oil, cilantro, garlic, chilies, pepper, and salt in a mixing bowl. Place the fish in a shallow glass or ceramic dish just large enough to hold it in a single layer. Pour the lime-juice mixture over it. The fish must be completely covered with the mixture. Add more lime juice if necessary. Cover tightly with plastic wrap and refrigerate for several hours (or overnight) until the fish is "soft cooked." (Make certain it has marinated long enough.) Serve on lettuce leaves garnished with onion rings, thin strips of pepper, and sweet potatoes and/or corn on the cob. About 19 percent of the population of Peru are classified as undernourished by the World Bank. This means they do not receive adequate nutrition in their diet. Of children under the age of five, about 8 percent are underweight, and over one-quarter are stunted (short for their age). In a 1992–1993 census, it was found that nearly 22 percent of children aged 4-years-old and younger suffered from a serious Vitamin A deficiency. A lack of this vitamin can lead to blindness. In addition, iodine deficiencies have caused nearly one-third of school age children to develop goiter, an inflammation of the thyroid gland (usually in the neck). Protein deficiencies are declining, thanks to the introduction of high-protein maize, according to the United States Mission to the European Union. High levels of protein can prevent malnourishment in children growing up in developing nations, such as Peru. Organizations such as PROKID (also known as Help for Poor Peruvian Children) are helping to make a difference. Established in October 2000, one of the goals of the organization is to educate mothers about the nutritional needs of their children. Falconer, Kieran. Peru: Cultures of the World . Tarrytown, N.Y.: Marshall Cavendish Corporation, 1995. King, David C. Peru: Lost Cities, Found Hopes . Tarrytown, N.Y.: Benchmark Books, 1998. Peru . 4 th ed. Victoria, Australia: Lonely Planet Publications Pty. Ltd., 2000. Peru Handbook . 2 nd ed. Bath, England: Footprint Handbooks, 1999. The Rough Guide to Peru . 3 rd ed. London: Rough Guides Ltd., 1997. Traveler's Peru Companion . Old Saybrook, CT: The Globe Pequot Press, 1999. Authentic Peruvian Cuisine. [Online] Available http://www.thaiperurestaurant.com/Peru-SIDE.html (accessed April 18, 2001). Christmas in Peru. [Online] Available http://www.christmas.com/pe/1504 (accessed April 18, 2001). LAPA (Latin American Parents Association). [Online] Available http://www.lapa.com/recetas.htm (accessed April 19, 2001). Peru: The Land of the Incas. [Online] Available http://members.tripod.com/~texcolca1/body/peru.html (accessed April 18, 2001). The WorldSchool 2000: Peru. [Online] Available http://www.worldhop.com/worldschool2000/journal/peru.html (accessed April 18, 2001). All of this food sounds and looks really good!!! I think im goin to make the Frozen Orange Delight! it looks soooooooo goood !